Too Wet Outside – Try Houseplants! Sonoma County offers gardeners such generally good growing conditions that most of us do not focus on houseplants. Why go through the trouble of dragging soil, pots (and often insects and disease) inside, when outside plant life abounds in all seasons? However, even here in our gardening Eden there are times when being out in the garden is just not practical, and during long, persistent rainstorms is one of them. Anyone who doubted that before last month is a newly formed convert! The garden beds are sodden and should not be trod in. The leaf litter and mulch is so wet that they cannot be worked. Chilly temperatures, gusty winds and still-short days generally accompanied the rain, so being outside was just not pleasant, even to the hardiest among us. Fortunately, there are easy ways to ward off the gloom and bring the garden mood inside. First and foremost, most of us took great comfort in the fact that we sorely needed that rain, even if we might have preferred to have it spaced out a bit! Then there are plants blooming right now (we’ve spotted narcissus, flowering plums and some early quince) that you can cut and bring indoors. If the boughs are full of buds, you can cut them and stand them in tall vases of warm water and the comparative heat of the house will force the buds to open. But what if what you miss is the smell of earth and the feeling of delight that gardeners experience when they spot a new bud or leaf or bloom? For that, you need a houseplant; no temporal bouquet of cut flowers is going to do the trick. Houseplants range from the leviathans that populate office lobbies to the short-lived, showy holiday-specific sorts like poinsettias and Easter lilies. Somewhere in the middle are the readily available (they are sold in most supermarkets!) African violets, that are too-often overlooked because they are deemed too common and not sophisticated enough. At least one Master Gardener begs to differ, however, and shares with us the joys of growing this old-fashioned plant in her kitchen. Saintpaulia – What Is It? Saintpaulia is not a beer – that’s St. Pauli Girl! 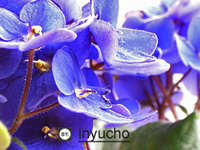 Saintpaulia is an African violet – did you know that? I discovered this bit of information when I finally took the initiative to learn something about my six African violets. I didn’t buy them, (I didn’t think that I liked African violets), but I inherited a couple from my aunt and received the others as gifts – how could I not love them! They have languished in my garden window over the kitchen sink for many years now, and every time I think “I am going to get rid of those things”, they start blooming like crazy and really look quite pretty, and then I give them another chance. When they aren’t’ blooming, they look scraggly, crowded and kind of ugly. So what do I do with them – toss them or learn to take care of them? Sooo – the first thing I learned? 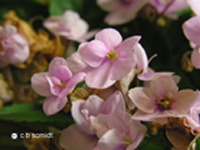 Most African violets, the most popular flowering houseplant per Sunset Western Garden book, are hybrids derived from native species from East Africa. Most of those sold in stores and garden centers lack a specific name; if you go to a specialist supplier you can have a choice of hundreds of varieties accurately named. Okay, so mine are the common grocery store variety. Leaf shapes? Did you know that there are boy leaves (plain green, no spot at the leaf base) and girl leaves (same shape but with a small white spot or blotch at the base)? I guess mine are all boys because I couldn’t find any white spots or blotches. Other leaf types – lance leaves (longer and more pointed at the end), spoon leaves (rolled-up edges), and variegated leaves (mottled or specked with white or cream). All that information is good to know, but how do you take care of these plants? Soil preference - moisture-retentive but fast-draining potting soil. Using purchased African violet mix is one way to go (my way) or you can make your own using 3 parts peat moss to 1 part perlite and I part compost or sterilized loam. These plants bloom best when the roots are crowded so don’t use too large a pot. A couple of my plants really do look crowded, but they bloom so do I repot or leave them? A decision for me! Light - African violets like indirect bright light. Strong light without direct sun is the best – no direct summer sun during the hottest part of the day. Oh, oh - my garden window gets direct sun in the late summer afternoon. Windowsill plants usually bloom in spring and summer when the light is good, but mine bloom in December so go figure that one out! They grow well under artificial light (5,000 lux). Supplemental lighting may keep them blooming for most of the year. Humidity – high humidity is recommended, but misting is not appropriate as water may remain on the hairy leaves and cause rotting. If humidity is needed, place the pot over a saucer filled with wet gravel, pebbles, or marbles. Well, my kitchen sink provides much humidity for the garden window so that is one thing I inadvertently did right! Watering and feeding – water plants freely spring through autumn, allowing the soil surface to dry out a little before watering again. Water moderately during the winter months. Avoid getting the leaves or root crown wet. Oops - my plants are usually drooping before I water them and keeping the leaves dry has not been on my ‘be careful of the leaves’ list. Use water that is room temperature – another oops! Fertilize during active growth (when soil is moist) with slightly acid fertilizer. If plant produces few flowers and lots of leaves, switch to a low-nitrogen fertilizer as you may be overfeeding. Overfeeding? No problem for me – I never fertilize. So now I have some decisions to make. Do I move my plants out of that garden window during the hot summer months (where will I put them)? Do I repot the ones I think are crowded in their pots? Will I be more careful when I water? Should I start fertilizing? Considering all of the things I haven’t done for those poor plants, it is truly amazing that they have survived as well as they have, and bloomed as reliably. However, I do believe that my Saintpaulia would probably look better to me after I have a glass of St. Pauli Girl!